I have always loved art and the serenity it brings me. Whether I am in the presence of great art, or I am painting myself, it soothes me. However, I had never seen ‘body art’ until attending beginners face painting course and was shown a few images of amazing pieces of art painted on the human body. I was blown away. From there I was offered a job and I started experimenting with the paints I was provided with. I fell in love. I started painting every day and eventually I came across illusion and 3D body art. I quickly got the hang of everything I needed to create these illusions. The final illusion is created by a combination of the perfect lighting, solid black paint to create negative space, a black background and the right angle. Once I’ve captured the perfect photo, I then use a photo editing app that allows me to fade the black paint to blend in with my background. I’m inspired by so many different things… Culture, music, movies and bright colours. I’m motivated by my love for art and my passion for painting. It’s gotten to the point where if I don’t paint something each day, it feels as though I’m suffering withdrawals. 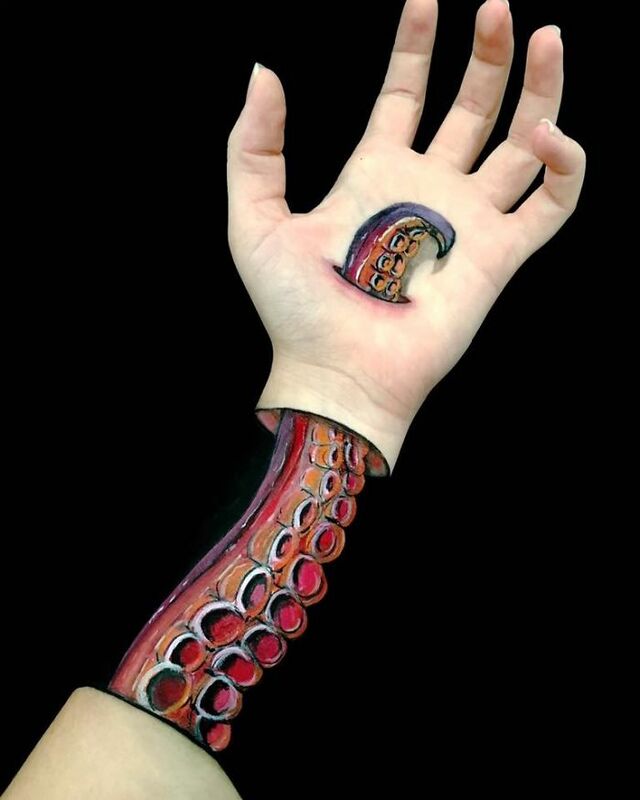 I love illusion style body art because it’s so out of the ordinary. Which is why I think I’m drawn to it. I’ve always been fascinated by anything weird or unusual.